New item available at Arkansas Crystal Works! I am proud to announce a new item that has been a couple of years in the making. 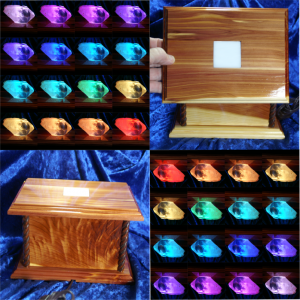 Handcrafted, lighted crystal display boxes! The boxes have been ready to go and I have been diligently trying to get them photographed and described. What are lighted crystal display boxes, exactly? 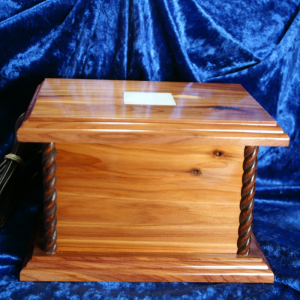 These beautiful boxes are meticulously hand crafted out of red cedar or stained clear pine and have LED lights inside. The lights have 16 colors and a remote control. When turned on the crystal gives off a loving glow. Rainbows and inclusions become more pronounced and intricacies within the crystal are highlighted in unexpected ways. These crystal display boxes are hand crafted by my partner Patti. From start to finish, everything is hand-crafted, including cutting and polishing the stained glass, and installing the electronics. They are made out of either red cedar or stained clear pine (see individual box for wood type and/or stain color). It’s quite a process from start to finish. The journey of the box starts at a cedar mill here in Arkansas. Beginning with rough planks, Patti planes and then sands the wood. 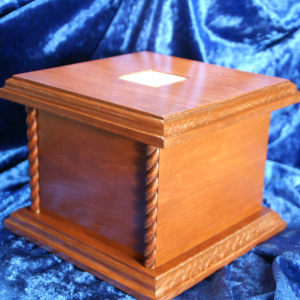 Next she cuts it to size, and routers a design onto the edges of the top and bottom. The hole which the crystal sits over is cut out with a scroll saw and a piece of stained glass is cut to size, polished and inlaid into the top allowing the light to shine through. After that she glues and screws all the pieces together seamlessly. Finally she coats the boxes with clear polyurethane for a glossy shine. 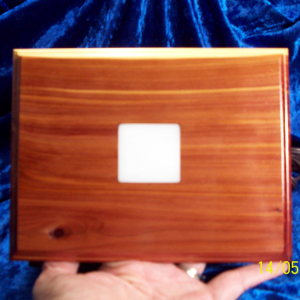 It is amazing to see a rough cedar plank turn into a polished crystal display box! This is a beautiful way to illuminate and display your favorite crystal on a handcrafted base. 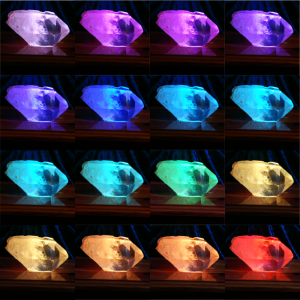 Why display your crystal on LED light? What makes LED lighting special? Just a few benefits of LED lighting are: a long lifetime, efficiency, they are eco-friendly, durable, there is minimal heat, they are “dimmable” and cost efficient. According to Great Eastern Energy, while incandescent lights last for 800 to 1500 hours, and fluorescent lights last up to 10,000 hours, LEDs can last up to a whopping 60,000 hours. I did the math and discovered that incredibly, ours has been going strong for over 13,000 hours so far! While it is true that it is a beautiful display, and excellent for interior decorating, design, and collecting, it is also incredibly soothing and healing. Patti wires the LED light inside the box (which comes with a remote control). There are 16 different colors from which to choose and 4 rotation settings. The controller allows you to select a single color or to fade through all 16 colors and will allow the light to dim or brighten. The picture to the left is a shot of all the different colors the light fades through. You can choose to have the lights fade through the spectrum or select just one color to highlight a particular color ie: to match your mood or for healing). These boxes truly are stunning when you light your crystal with them. They look great with large points. Clusters look super, too, if they don’t have a thick matrix (so the light can shine through). The patterns and detail that show up in the crystal when lighted can be breathtaking. It is very calming and soothing. We have had our lighted display box running pretty much non-stop for a year and a half (and counting). The lid is removable and the light bulbs are replaceable. The glow that is created through the crystal is both stunning and soothing. Click here to see the boxes available for purchase at Arkansas Crystal works.